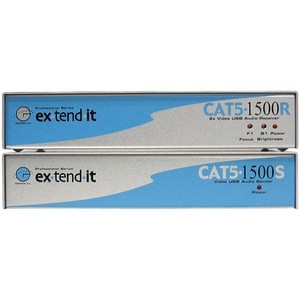 The CAT5 1500 allows users the benefits of extending VGA, USB, and audio signals beyond the desktop. In a growing number of applications, broadcast stations and production facilities there is a need to control a computer remotely. The keyboard, mouse, and video monitor are relocated to the remote side. A CPU may need to be shared between several users or moved to another room because of annoying fan noise. The CAT5 1500 can be used to extend computers with printers, hard drives, scanners, cameras, keyboards, mouse, and any other USB-type devices. The CAT5 1500 has the potential to extend the distance of 330 feet over industry standard Category 5 (CAT-5) cable. One can connect multiple CAT5 1500 units to the same computer, allowing access to the same computer from different locations up to 330 feet apart.